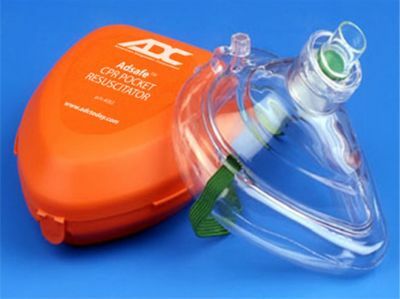 Our CPR mask features a high efficiency and low resistance one-way valve to minimize the possibilty of cross-contamination. For use with adults but can be inverted for children and infants. This features an ergonomically shaped mask with soft-air cushion for leak-free performance, easy grasp, and patient comfort. Elastic green strap keep mask in place on patient. Latex-free. Pocket storage case included.